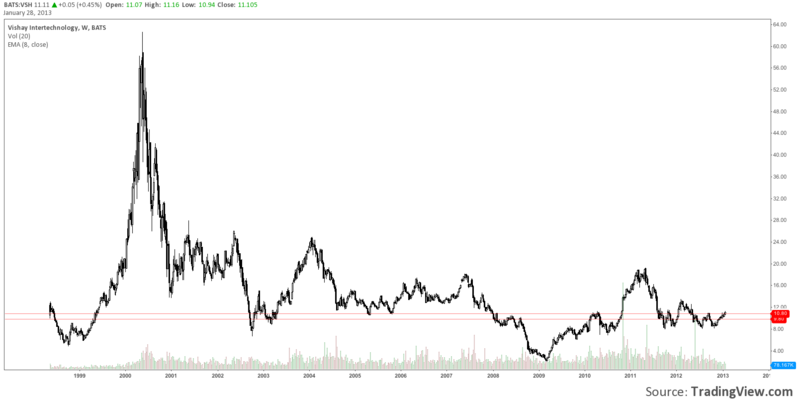 I’m going to run through a random bunch of charts that I’ve had up recently…good or bad. 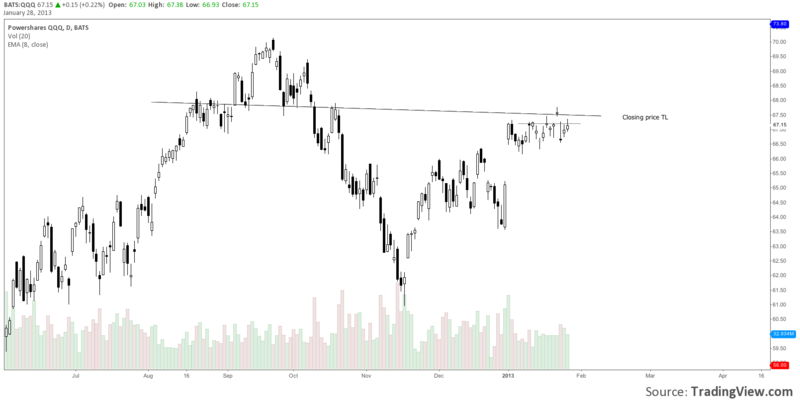 I normally like to update my Stocktwits stream if levels differ from those others posted or when I see something actionable, and will continue to do so, but in this instance I just wanted to create a quick library of some charts and thoughts in one spot on the blog to reference in the future. Many stocks have extended themselves from important swing points or are testing these points currently and it will be interesting to look back on this page in the coming months to see how anticipations have correlated with the chart levels- I think. The red lines show weekly sup/res at volume. Blue lines show weekly sup/res closing price levels. 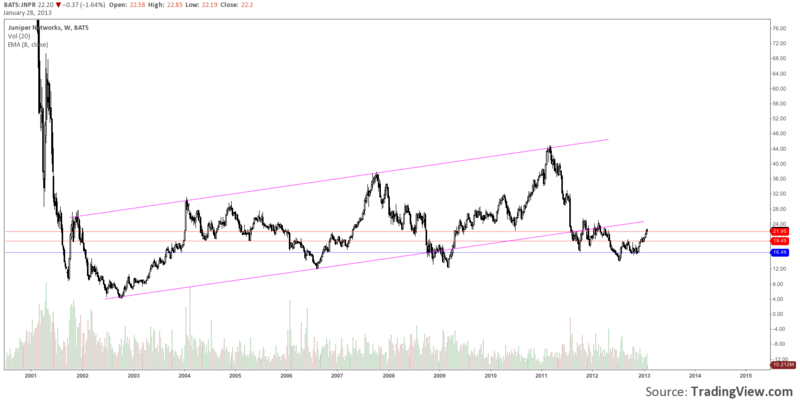 Pink lines weekly closing price TLs. Black lines are daily. Notes below each chart. SPY – Watching the 150.06 to 149.85 level push bulls and bears into a lulled state since the 24th of January 2013. Seems like an ascending triangle is forming and will break higher but the lower TL is certainly broken now with a lack of enthusiasm it seems. QQQ – Just does not look right. But everyone is calm and stocks are continuing to churn up setups. IYT – Perhaps the most important chart of the new year. 93.25 was a level that I believed in greatly and which IYT spent early Dec rejecting creating a high level of pessimism in myself. However, once it held the move was huge as one should have expected. There was NO volume above 93.25. 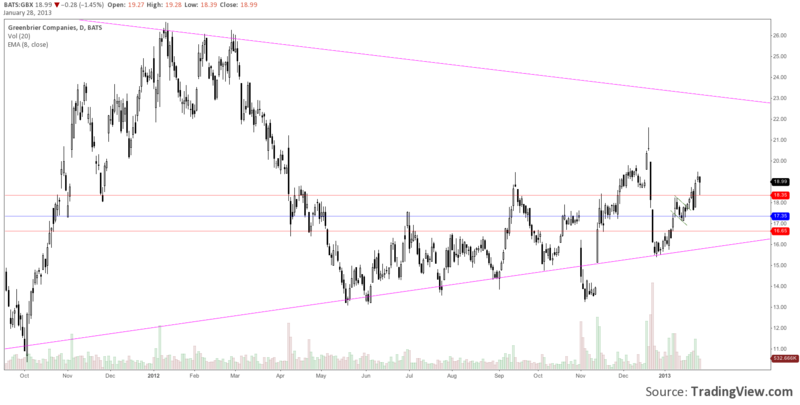 MUR – I just started following this today, it looks a bit extended against the daily TL but all it needs to do is hold 58.80 or higher for a strong move out of the triangle. Good volume showing. RF – I also started following this stock today. It has a very interesting weekly chart and price history is hinting at higher prices if 7.40 can hold. 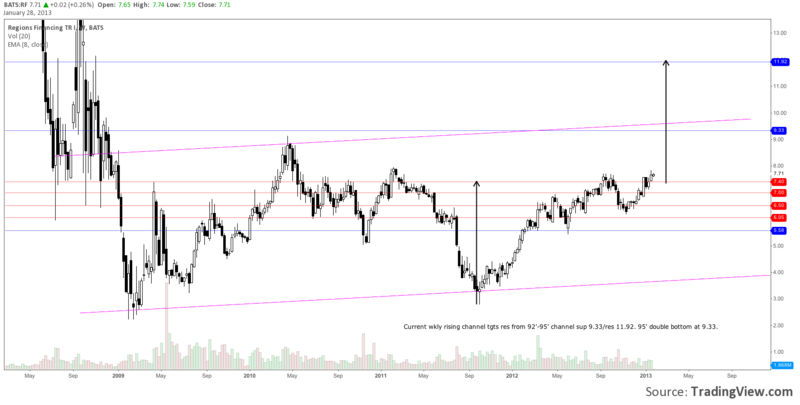 Both a rising channel resistance line above at 9.33 and a measured move out of a possible Inverse Head and Shoulders to 11.92 correlate to a weekly channel support and resistance range from 1992 – 1995. 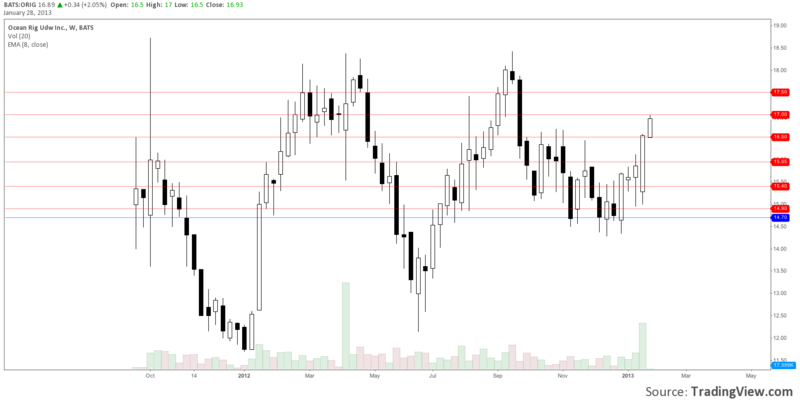 VSH – The weekly levels here show importance for bull bear zone are being tested currently at 10.80. There is good action off this level although the chart has been fairly flat for a long time. The daily chart below is leaning bullish with a possible W formation confirmation at this level. 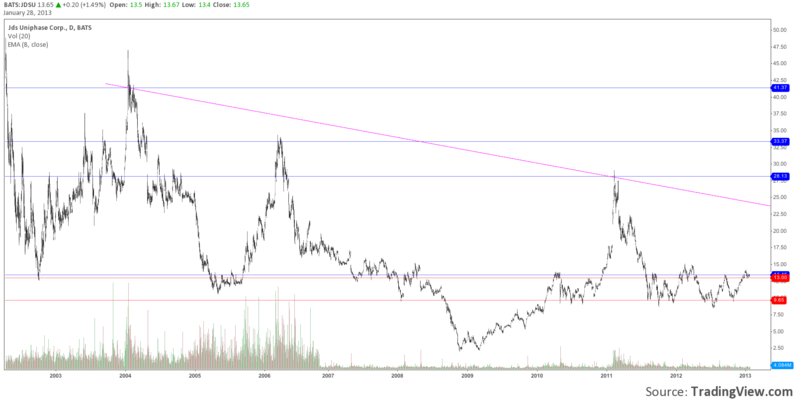 VSH – Possible W to test 2012 highs. 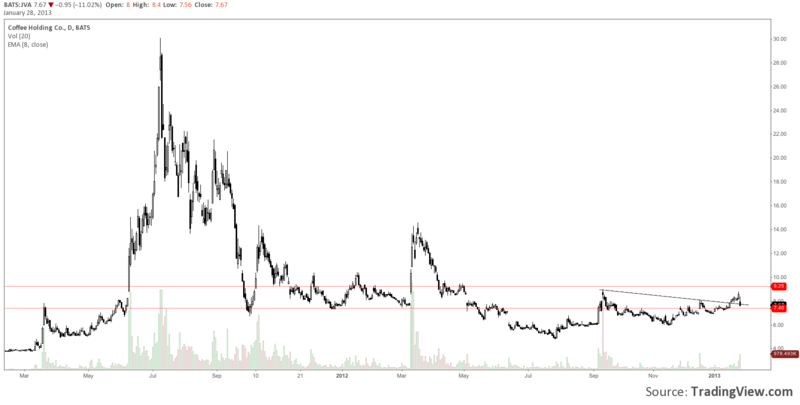 XCP – 7.00 got sold. Definitely use this level as a reference. 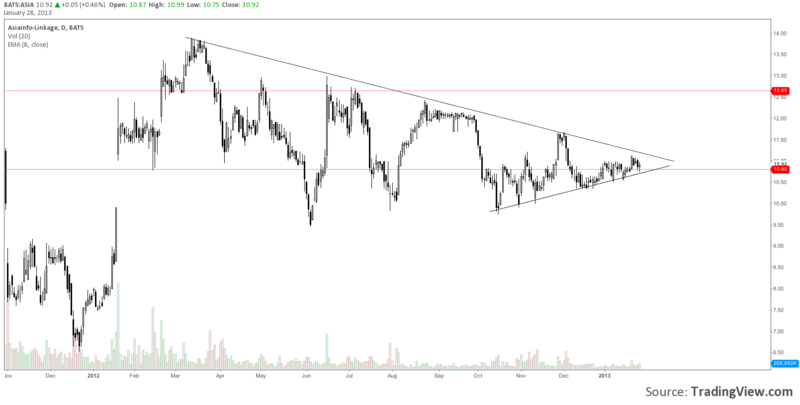 FTK – Stock has behaved very nicely to the breakout and to the weekly sup/res levels. 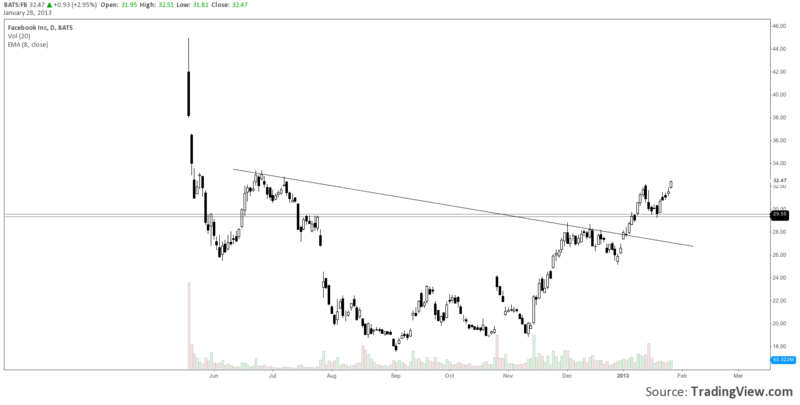 Could be creating a new level here for a move higher or a test of 12.60. 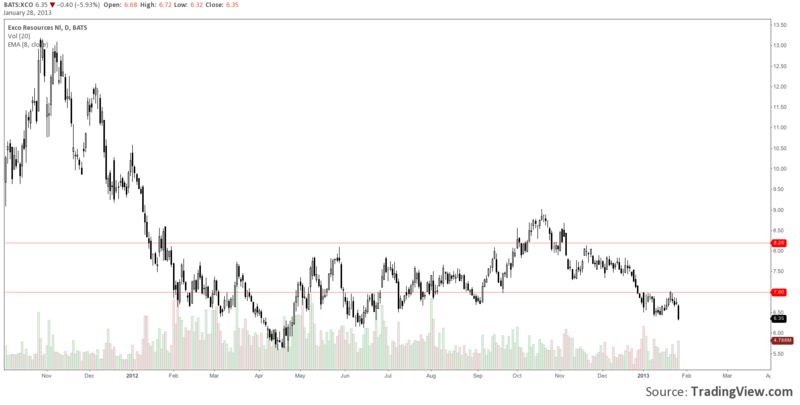 X – Steel has done well to come off a “bottom” but the door was shut quickly when it reached prior sup/res levels. Another one that needs to prove itself. Below the red lines you are not missing anything. Regaining the 30 level will produce a strong move. There will be plenty of time to see that move coming. IMO. VALE – I like where this chart is as it will illustrate in coming days/weeks the value of these levels on current pullback/backtest. There are daily fibs that point to a break of the lower sup level here on the weekly but a hold here is a must for long swings allowing for your risk parameters. Possible weekly Inverted Head and shoulders formation since June 2012 should show support at these levels as well, so there are multiple reasons to be worried if support fails. 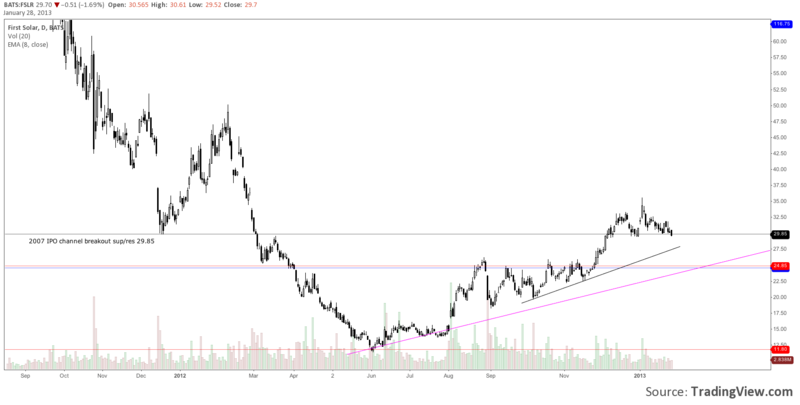 SVU – Lots of people watch this chart, its set up very responsibly so far and is in a low volume zone which should give the bulls a little more room to 4.20 before deciding again how much they want to swing. SKUL – This is mostly a short interest play. It looks to be getting juicy. Looking for a nice volume move above 6.94 closing. 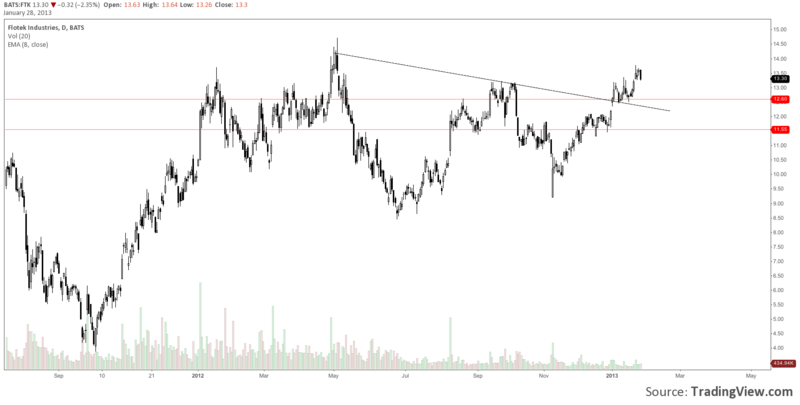 This could just flop about though below 9.00 if the environment for more breakouts sputters. SCO – I always give the contrarian plays a solid look. Its showing a very simple resistance line on the daily to be too much to handle currently. Watching for a test of the 36 level below with long standing Weekly bounce potential. 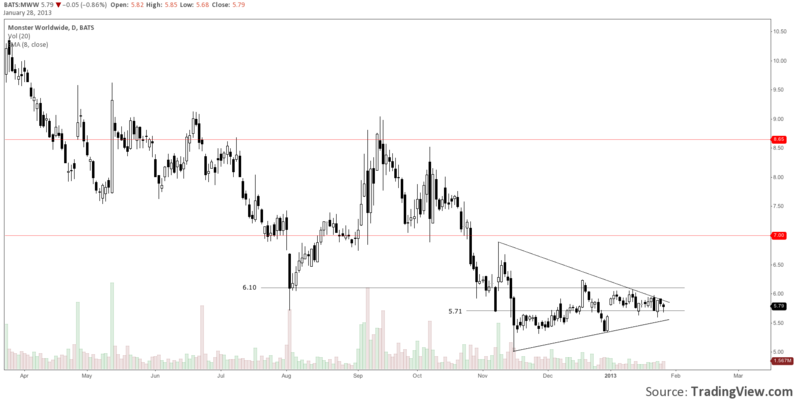 MCP – Another short squeeze candidate this stocks triangle got squashed when MCP had some announcement (looks like they announced, “We’re going lower!”) and is now below an important 3.20 level. Don’t look at it long below 3.20. ORIG – The big brother of DRYS, one of the worst stocks in the market, finally acting like it has some value to share. Many weekly volume levels are proving beneficial to higher prices as the IPO range consolidates. Originally we disliked this stock on a HS pattern, but reversed our thinking as 14.70 showed support. 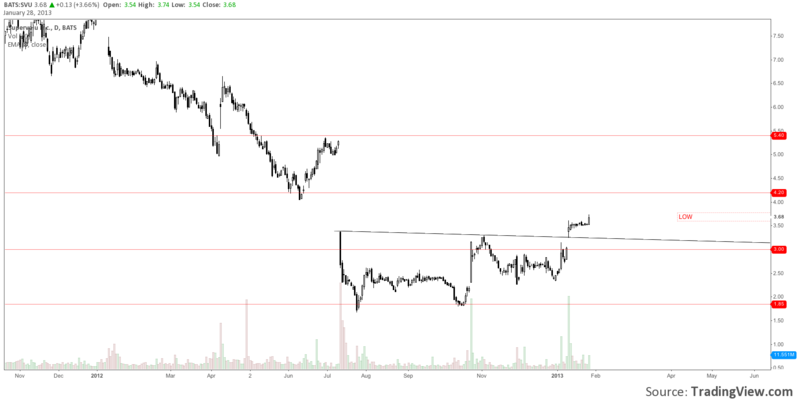 15.40 was the bull resistance and it has done nicely on volume since resolving that level. Continue to watch. OPEN – This is a great chart because above 47.50 there is very little volume resistance. Any strong buying should be able to move this stock quickly especially after setting up such a nice base. 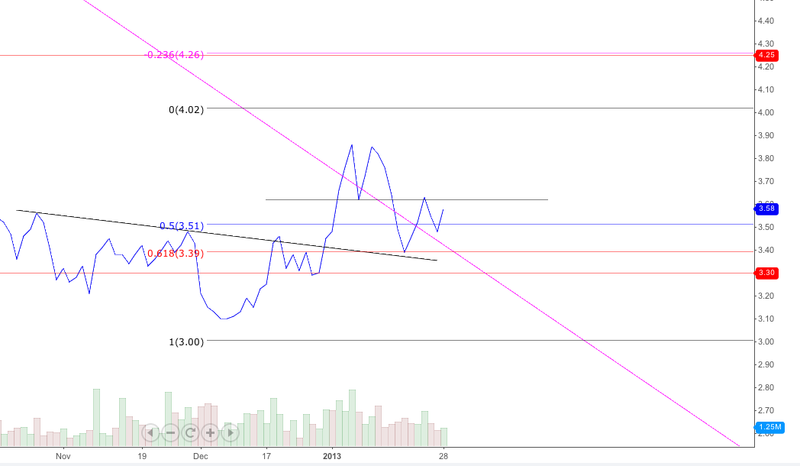 52.40 should be intermediate support. NM – More crap from the shipping industry starting to look ready. Holding 3.65 is worth a look. Over 4 and the volatility will pick up. NBR – Definitely one of my favorite charts these days. 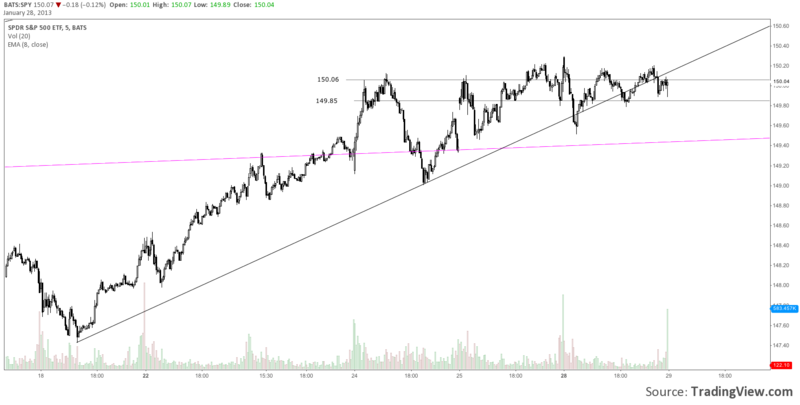 Action off the 15.55 level was almost flawless and timed beautifully with the TL break and volume. A prior posted longer view look at the weekly shows this level pivotal to steady trend establishment. MWW – Just a real interesting look. A chart that when it moves could be exciting. Like that its holding 5.71, but 6.10 and 7.00 levels are where swings holding will be immediately tested. Let it show itself, tough to time presently. LEAP – LEAP an old haunt. I shared my conspiracy theory on the stream in haste. Yet there is good seasonal correlation with this stock worth mentioning more responsibly in the future. A test of the TL here has not produced the price action the bulls would like. 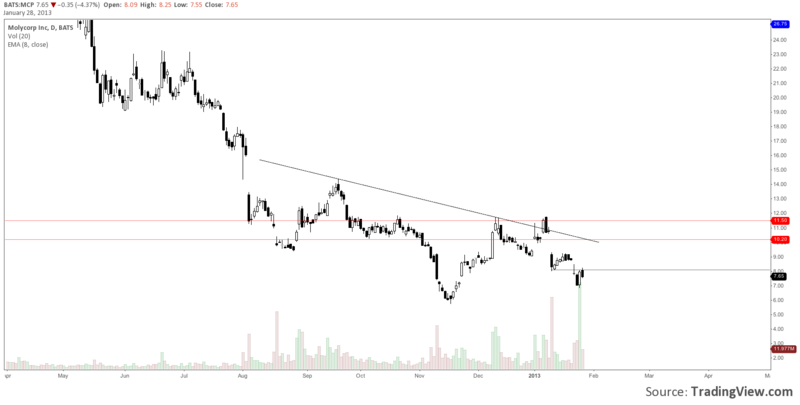 5.78 is proving resistance and while theres nothing but hope below it, I’ll keep an eye on it. MCP – Was a short squeeze look that got blown up on news. Still does not like trading over 8.08. 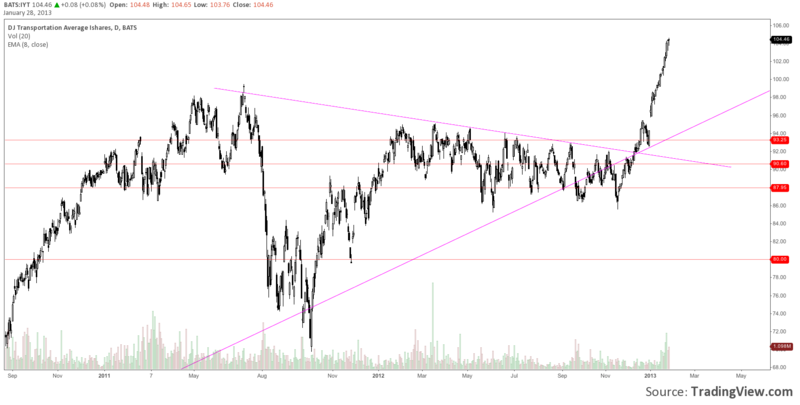 JVA – Another chart that makes you look like a magician after drawing a couple lines. 7.40 to 9.25 very important. Today I thought the backtest of the TL would hold but looks like 7.40 will get tested. Just be on the right side of the line, know your risk and this could continue to give opportunities. 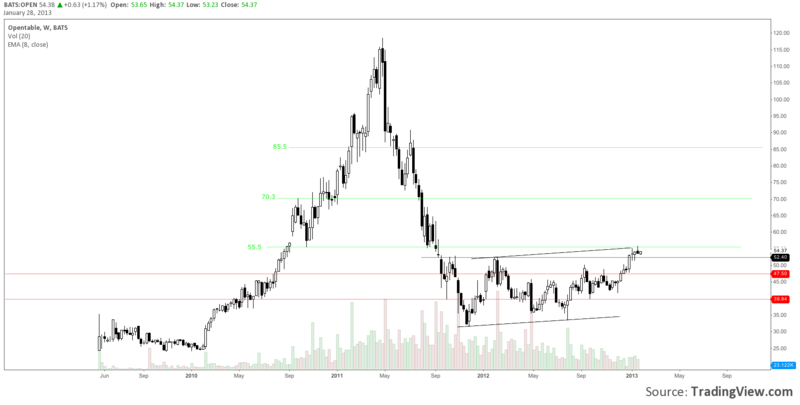 JDSU – I’ve done a lot of Elliott Wave analysis on JDSU that has panned out well in the past. 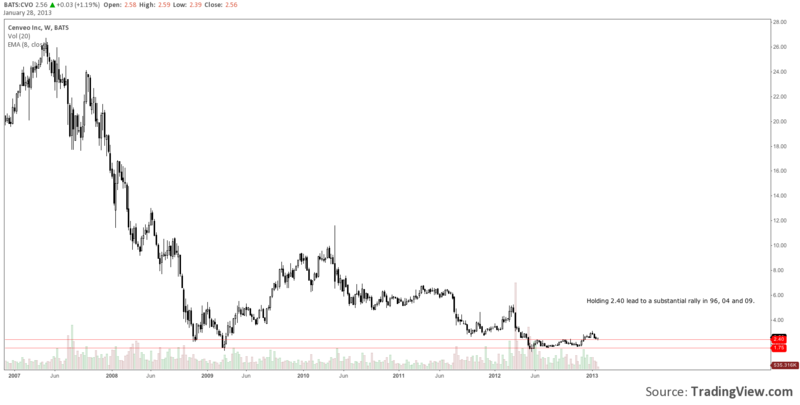 I think this is a great long term chart to trade that gives a lot of opportunities for big moves if you keep the big picture in mind. A dialed out view here of the daily shows why 13.00 – 13.46 has been churning the past couple weeks. JBLU – Delusions of grandeur. Neither the airlines or the traders that trade them will admit when they are beat. Lol. 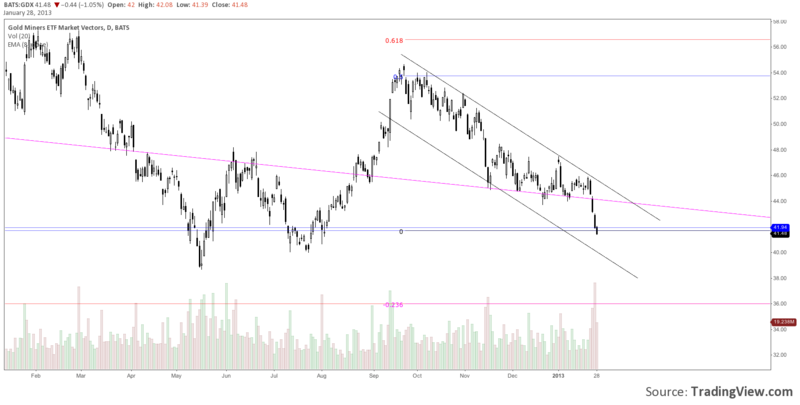 Still, JBLU shows strength at the breakout and consolidated nicely at the wkly 5.85 level below showing it has resolve to hold higher, perhaps. 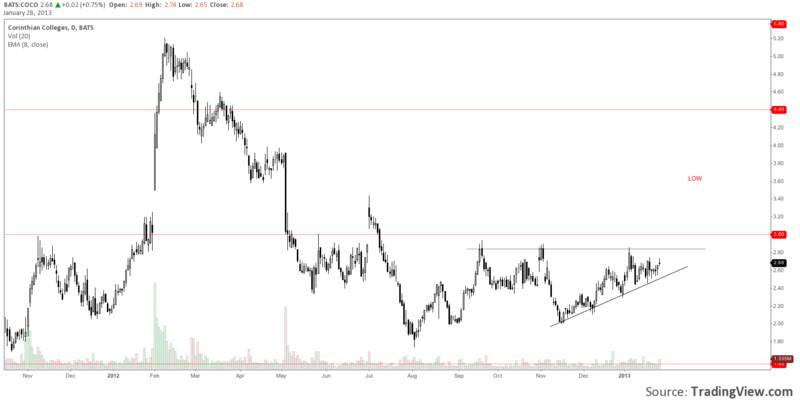 HL – I have done extensive Elliott work on Helca and I’ll take a pat on the back for reading this chart well since 5.77 became resistance. 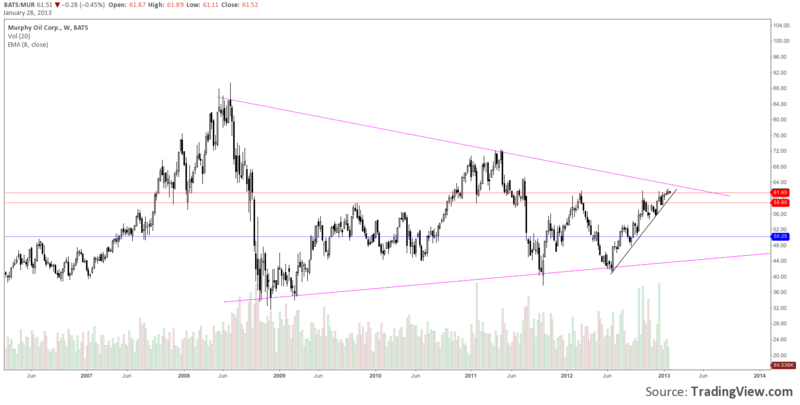 Recently the daily TL broke, it should lead to a test of the 5.00 mark, but ultimately this chart should be studied at the monthly time frame. Timing is a huge part of why this chart is not showing commitment in my opinion. Longer time frame charts are posted on my stream and will be updated there. 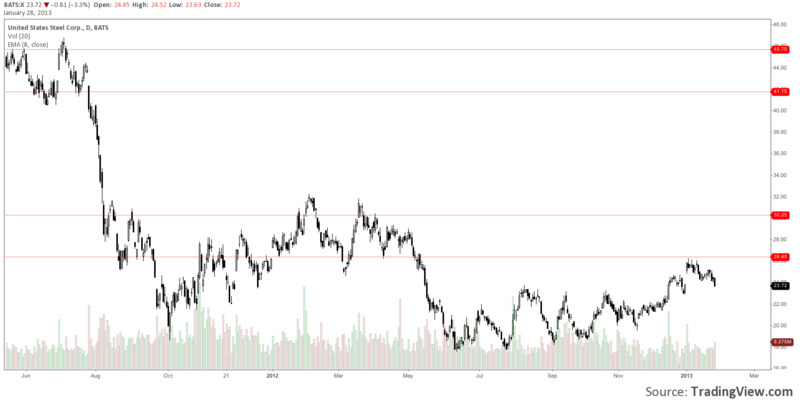 GLD – GLD, paper gold. 163.75 key level works in tandem with the rough 50% of range level shown in black horizontal TL. Like a fish out of water below 163.75, now below the daily TL and hearing little concern. Perfect. 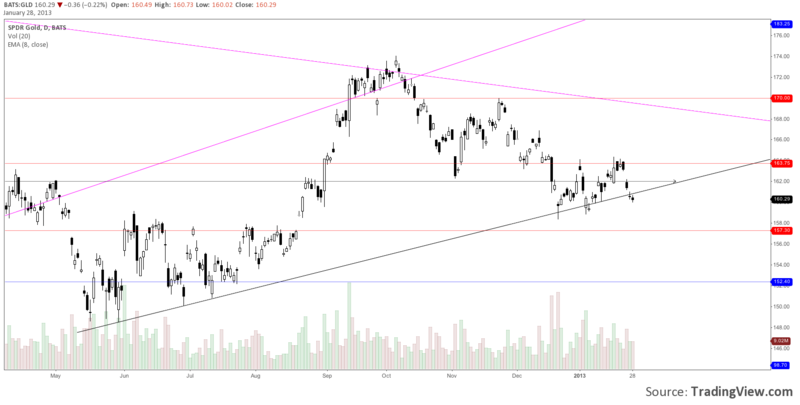 GDX – I believe that GDX will continue to trade lower. 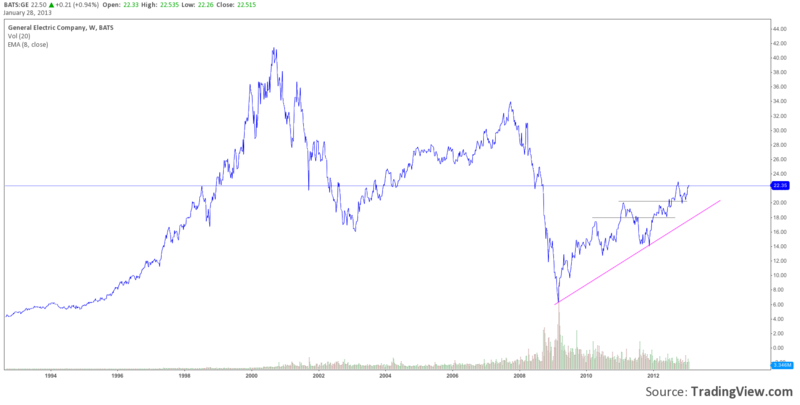 I charted a broadening top retracement in October of 2012 targeting 36 and charted more recently an Elliott Wave which was incomplete to the downside. Many people have been calling for sector strength all along. There have been a minority calling otherwise much smarter than I, but Im proud to have been a part of it in my own way. GE – I really like watching GE and many times over into the new year I have thought to myself that GE would be the canary for a move lower. It has been very slow to move higher until earnings but has now retest a very important line in the sand at 22.35 and closed above today. A daily chart below shows the zoom. 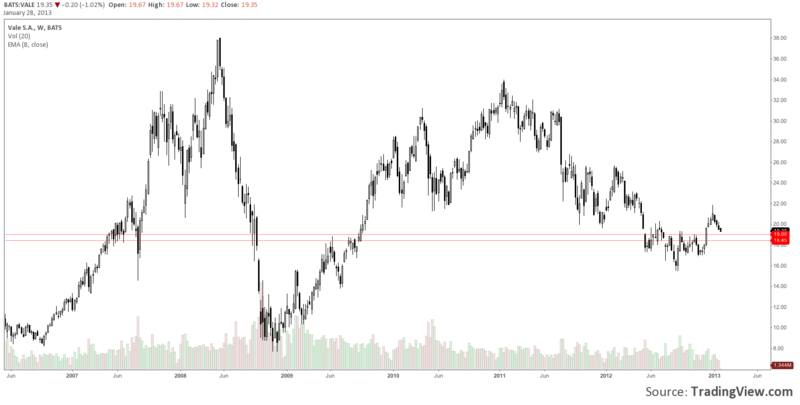 GE – The 22.35 level is important to hold. Unfortunately it was also a gap as first attempts to hold this level failed. 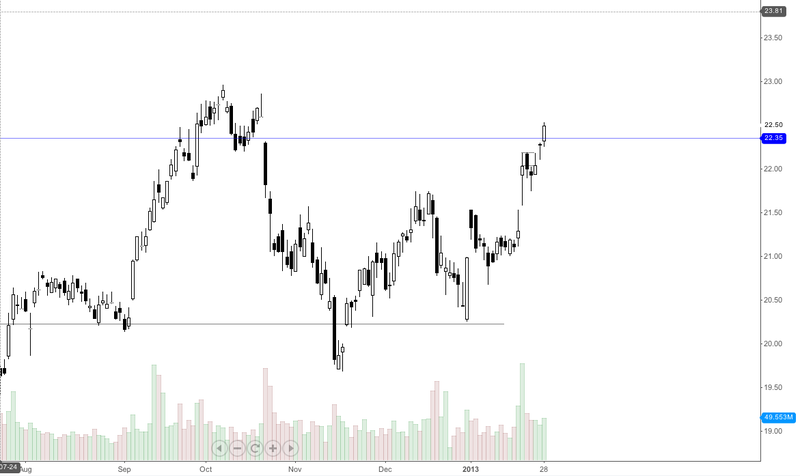 Continue to watch how GE handles filling this gap. 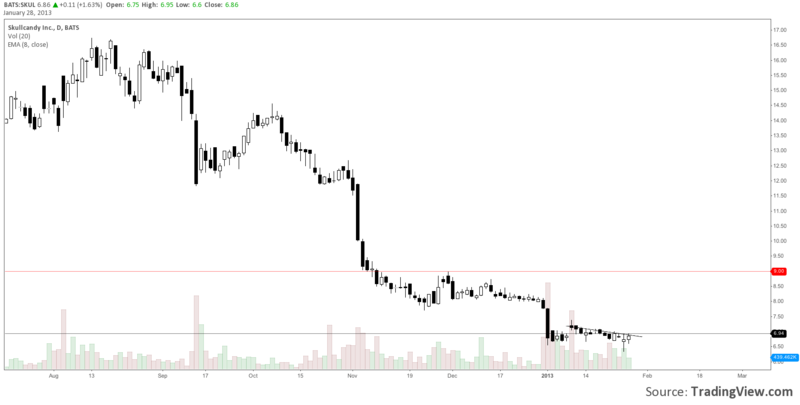 GBX – Chart has respected the weekly levels and the gap below much better than I anticipated. Good touch of 18.35 today to continue to monitor. 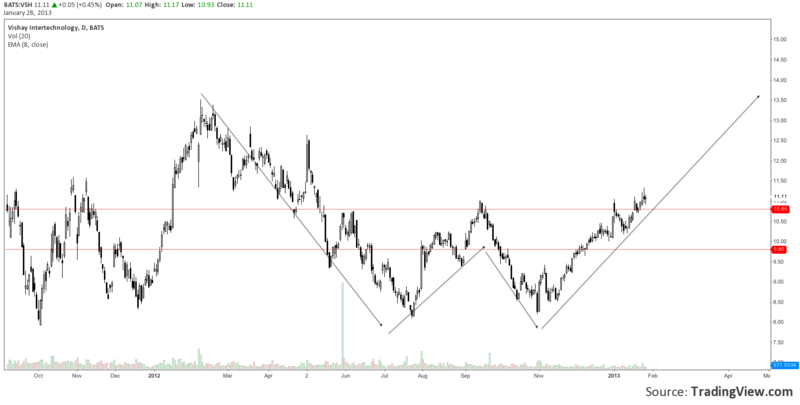 FSLR – I started looking at this chart when it broke 24.85 and it has done well to hold its IPO level noted on chart until today foretelling a test lower perhaps. This chart has many great patterns showing potential swing levels coming up. Regardless, above 29.85 is a long. Below here though let it pick its spot and show you the trade anticipating lower levels today. 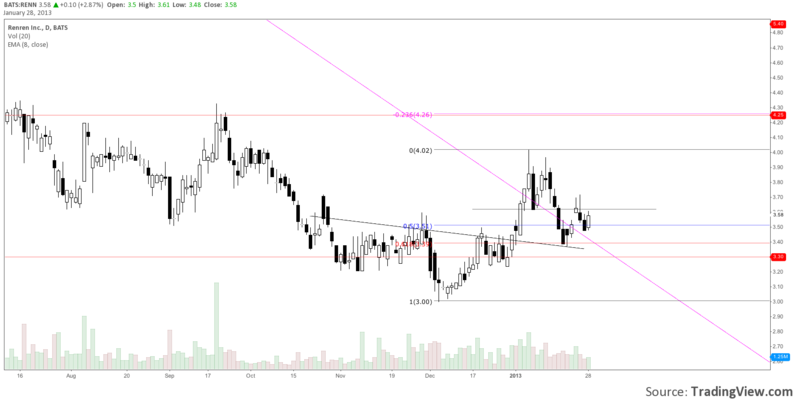 CVO – Long term weekly look shows respecting levels right now. It held 2.40 in 1996, 2004 and 2009 for good gains. 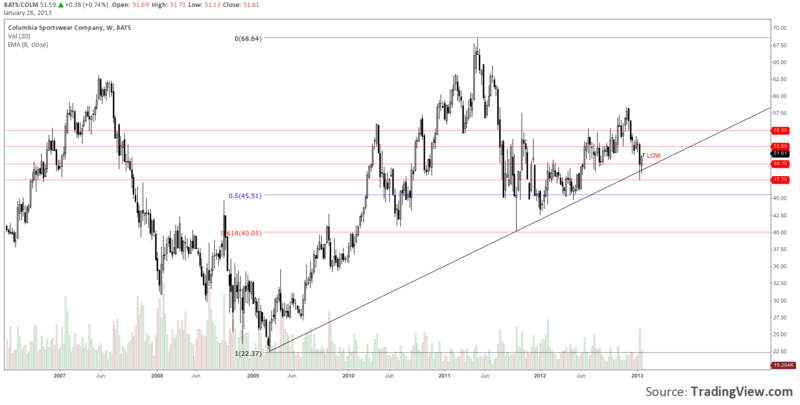 COLM – Not a great chart but respecting a large TL support level as well as an important pivot price level at 47.70. 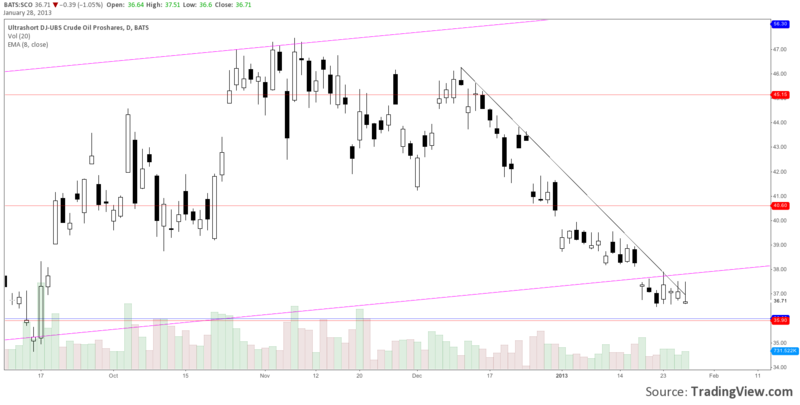 Low volume zone should make for further upside to 52.60. Fibs show price discovery may already be resolved lower. 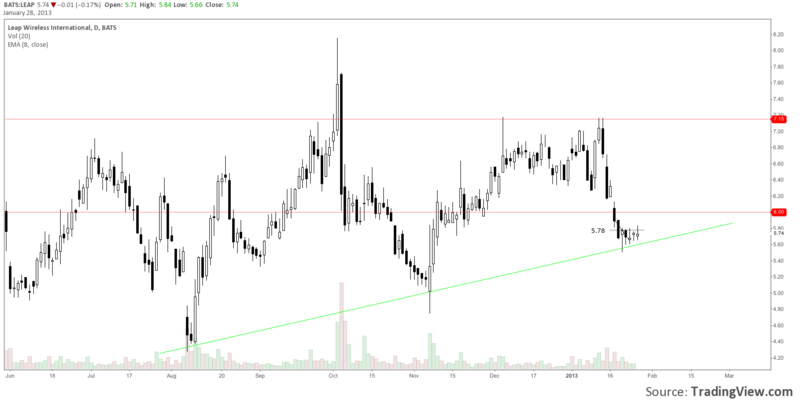 COCO – A nice ascending triangle pattern which could resolve into a low volume zone. Time to watch. 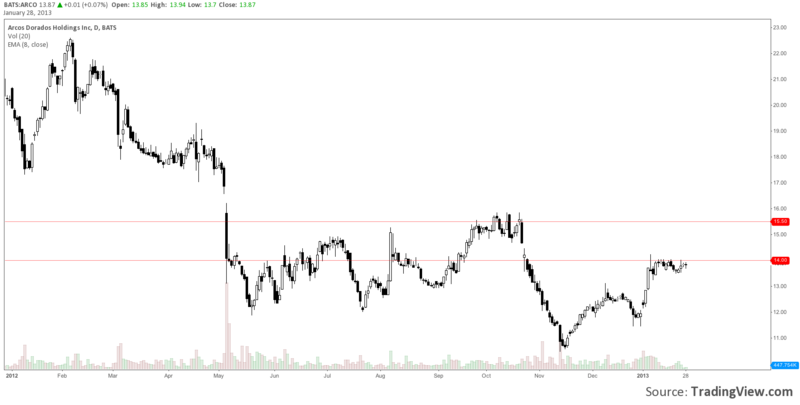 ASIA – Not proving itself for a swing yet but respecting the 10.80 level of late is worth continuing to note. 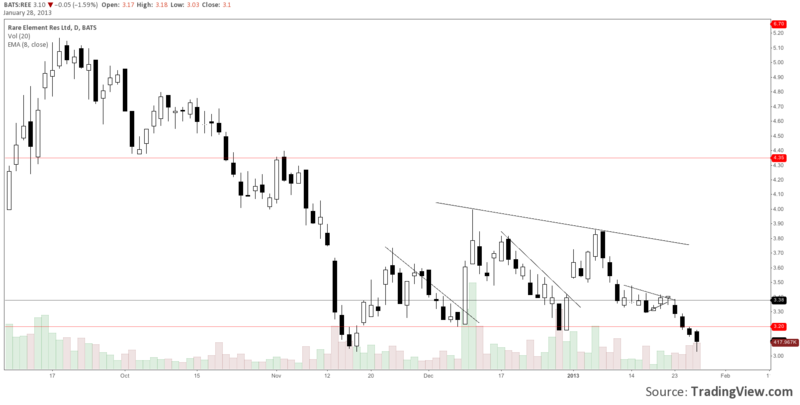 ARCO – Daily flag sitting right under an important weekly sup/res level at 14.00. ANR – Interesting price action inside the larger weekly sup/res levels. Like to see 10.93 start to act a part. Currently head and shoulders possible for test lower to TL. 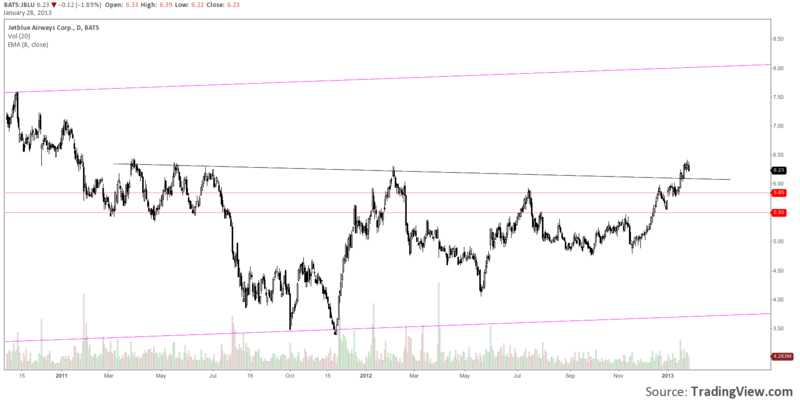 However, watch 8.55 if stock wants to show strength and greater commitment to a test higher. RENN – Good and bad to be watching RENN. Think it has great potential but the price action can seem un-committed for sure. 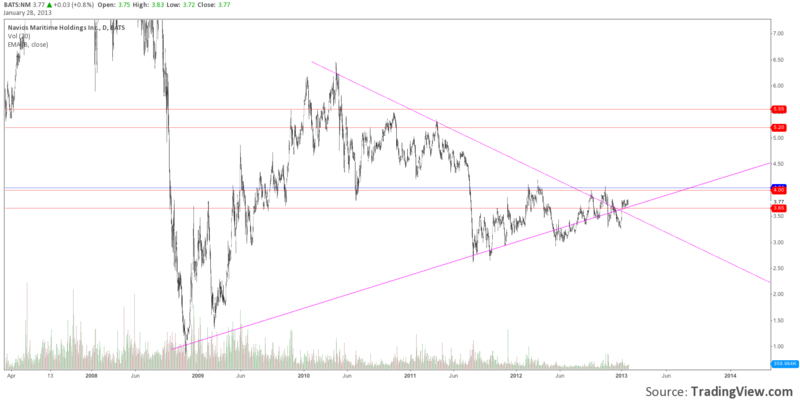 Great action off holding 3.30 and breaking TL on the daily led to a test of the Oct 2012 resistance and a complete backtest of the move has occurred. Looks discouraging yet has held the backtest as well as 618 fib. A look at the closing price chart below cleans it up. 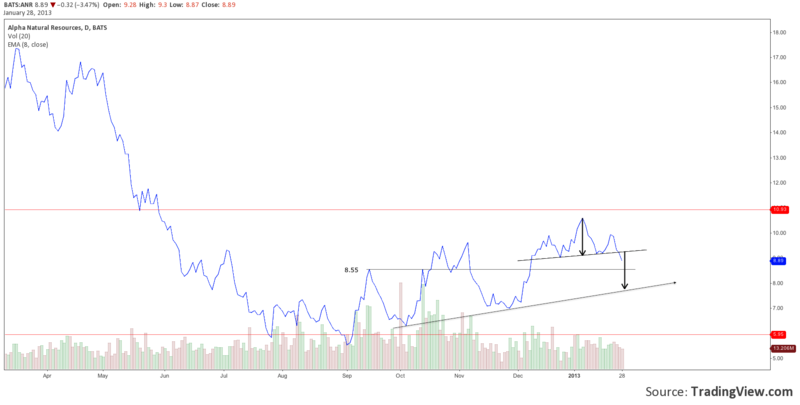 RENN – Price has respected the breakout level so far. 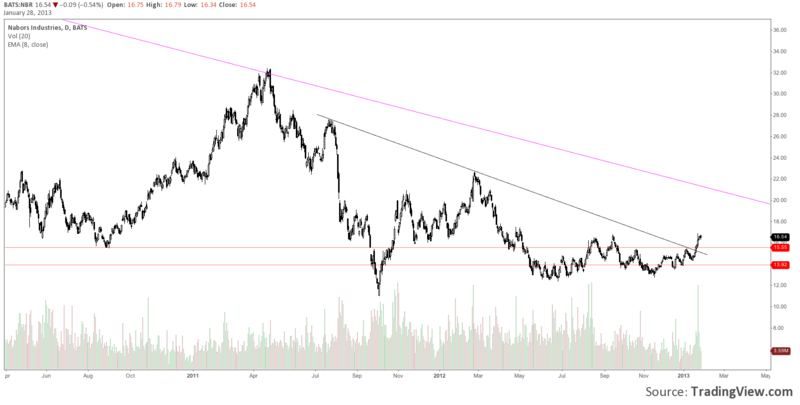 The pink weekly TL is perhaps the biggest concern for swings. 3.30 is the bogey. At a nice level here to take a shot. FB – Very happy to have called a turn on Jan 18 within minutes of the low. The daily shows its an important swing level. So far so good. Rewarding traders. 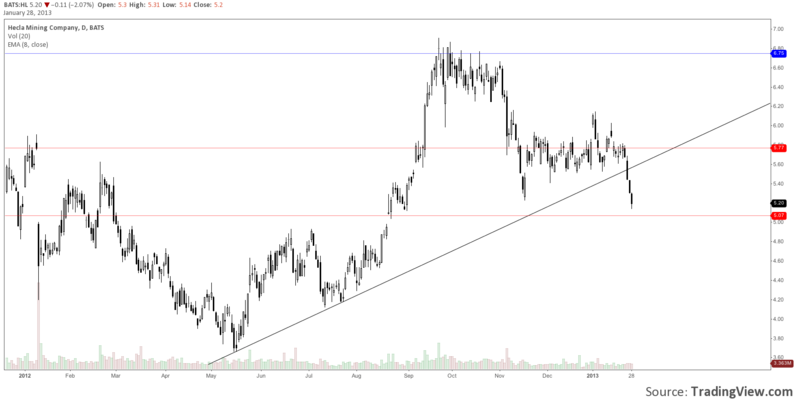 JNPR – Continue to watch 21.95 for support. Level acted well intraday after break higher.